I remember driving through Iowa on interstate 80 some fourteen years ago, the trip from LA to Chicago. I was not particularly fond of the state. The roads were bad and the scenery was boring. If I remember correctly, I called a friend to keep me from getting bored out of my mind. Some things don’t change; the roads are still pretty bad, very bumpy. But I haven’t gotten bored yet and I have been driving through fields of corn, soybeans and alfalfa for a couple of hundred miles. 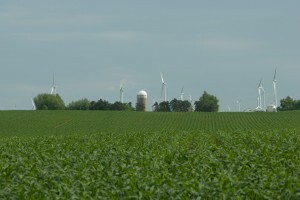 Sprinkled in with the fields are wind turbines and hog farms. The buildings for the hogs look just like the chicken houses back in Arkansas, but the smell is distinctly pig. It is really amazing to see nothing but cultivated fields as far as the eye can see. No forests or even larger groupings of trees. Overall Iowa is flat, not as flat as I would like, but Kansas and Nebraska were hillier. I entered the state by crossing the Missouri River at Decatur, Nebraska. I was lucky to still make it across the bridge given the current flood stage of the Missouri. I followed highway 175 from Onawa to Mapleton. Not expecting to see any larger hills I was surprised when I saw this large uplift in front of me, the Loess Hills. They are 200 feet high and span from Sioux City all the way down to the Missouri state border, some 200 miles. The area in the west is somewhat hilly and fields are planted on terraces just like the rice paddies in China. 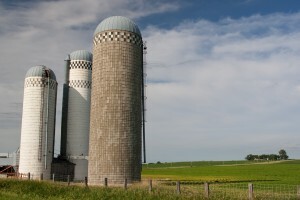 Having seen several agriculture states I find the differences in barn construction and grain silos from state to state interesting. 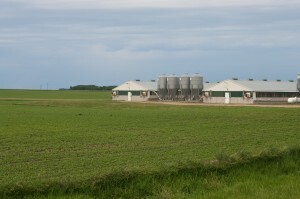 Red barns versus white barns, single silo versus attached silo rows. Come on, there is nothing else to see, might as well find something interesting. I spent two nights at the Black Hawk Lake State Park in Lake View. The lake is one of very few natural lakes in the state and not the result of dam building. Note to self: Do not stay at state parks during the summer on weekends if you want peace and quiet! Since I didn’t know anything about Iowa, I asked the rangers at the park where to go and what to see and I consulted my Road Trip USA book. Between the two I came up with a route through Iowa and some interesting places to see. 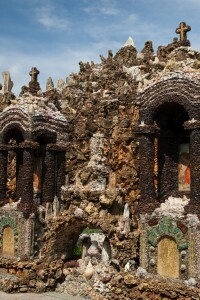 block; it is the largest grotto in the world. 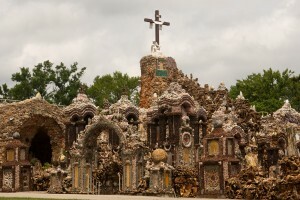 I have traveled around this country a lot and I have seen many beautiful and incredible landscapes and still I found this man-made Grotto to be among one of the most amazing things I have see. Dobberstein’s imagination, craftsmanship (he was German) and his use of nature’s creation just made for one spectacular structure. You have to see it with your own eyes to get the full grasp of it. Let’s see what other surprises Iowa has in store for me. I’m actually doing research for an art project, and I stumbled across this blog. It is certainly interesting. I am hoping to read more of it later. However, as I was researching Iowa, I read this section. I happen to be from Iowa, and often traipse about the Midwest (I went to school in Indiana, and have family in a matter of states). I found it interesting that you described Iowa as nearly entirely flat because, here on the west side, we are ENTIRELY hilly! I am so very incredibly bored when I drive to school, because I have to suffer through both Illinois and Indiana, which are much more flat. My friends from Indiana commented on how hilly the state is, because they haven’t been out this way before. 🙂 Indeed, I live among the Loess Hills and, yes, they can be a beauty. The terraces have been around for decades and, I recently learned, were actually constructed, carved, and encouraged by the federal government back in the 1950s. Officials actually came out to the land and taught the farmers how to build them because there was so much erosion at the time. Anyway, I apologize for the lengthy comment. I could keep going; I love Iowa more than I care to admit. (Though I know I won’t stay here forever.) Your blog is very interesting; I hope to read more! Enjoy your trips around the United States! I’m sure you have seen many beautiful things! thanks for your interest in my blog. I am always happy to hear when people, other than my friends, enjoy the blog. 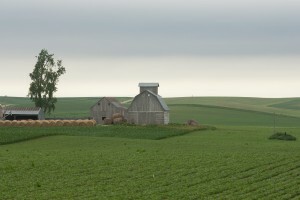 Iowa is a diverse place with hills / mountains in the east and west of the state. Next time you have to drive to Illinois or Indiana, try to stay off the interstates. The smaller highways are more interesting and you are less likely to get bored.